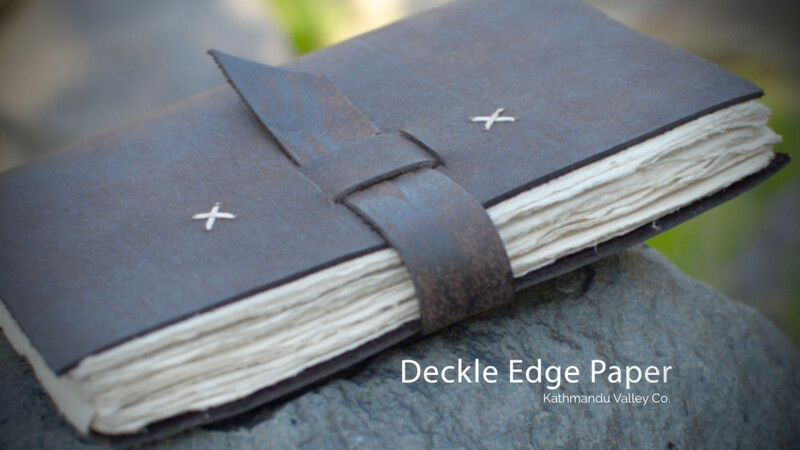 The Nepali Traveler Rustic Leather Journal is one of our most popular journals. The buckle closure and water buffalo leather makes it a favorite. The journal features Lokta Paper which is made by hand in the high himalayan mountains of Nepal. Textured from the fibrous inner bark made to use the paper, Lokta paper can still sport traces of the boxed screens used to make the paper. The inner strippings of the bark are cooked into a mash and then spread onto boxed screens and set to dry on the himalayan mountainside. Deckle edges leave a unique and rustic roughness to the paper, yet the edges are soft like fabric. Use yours to capture your adventure, sketch, or record important happenings in your life. The Nepali Traveler Rustic Leather Journal is the perfect place to keep them.